., Architectural Association School of Architecture, . By 2050, London will no longer be able to expand outwards and so urban environments will become ever denser. The project explores future occupation of the tidal Thames, creating adaptive floating communities and housing dwellings, encouraging social interaction. The Thames will become far more dominant in terms of scale in the coming decades with more extreme tidal patterns. As sea levels rise, as weather patterns grow more chaotic, as population boom and urbanise, and as housing crises intensify – the relationship between architecture and water will become increasingly critical. How will our buildings adapt in these conditions, as well as embracing the potential of water as a latent renewable energy source? And, more importantly, how can we develop architecture capable of celebrating and enjoying these environmental changes by envisioning new ways of living in the future? 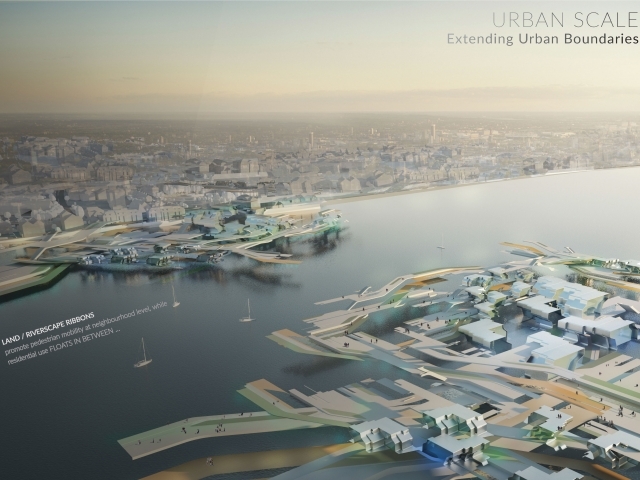 The project foresees the Thames estuary as a dynamic public space, using its tidal behaviour as a generator for renewable energy, as well as new spatial configurations & connections within London that communities on both sides of the river will occupy & share. 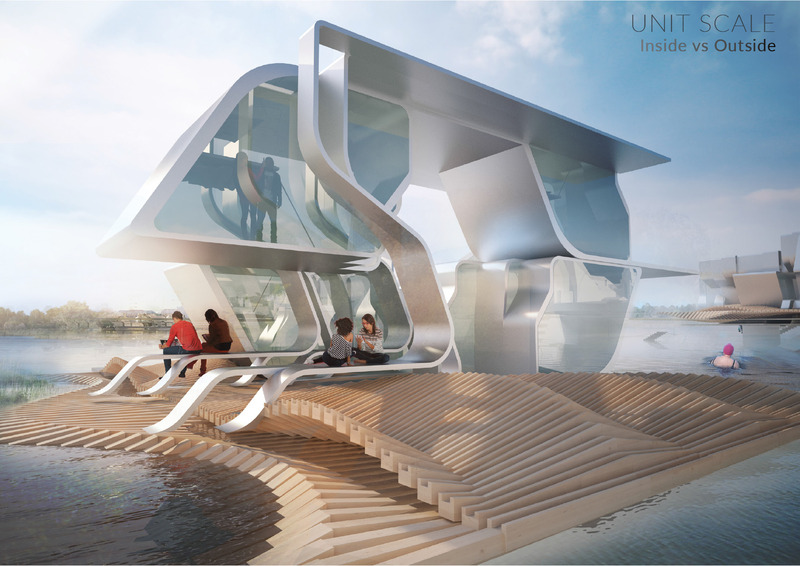 The living units interact with the river, transforming the changing tides into inhabitable space. 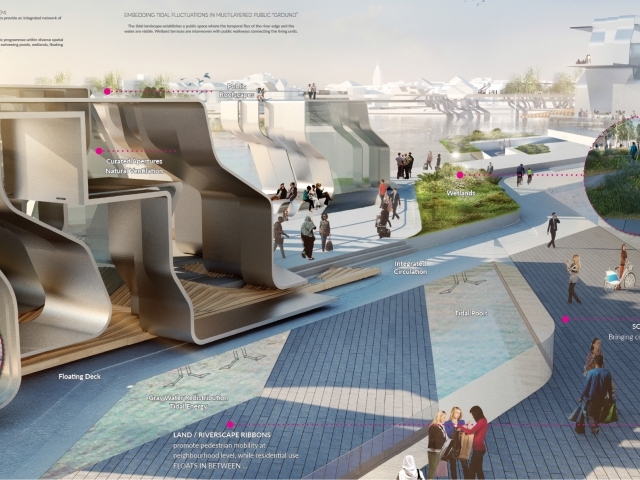 The tidal fluctuations form a dynamic hydro landscape — a unique public space where the temporal flux of the dwellings and the river are interwoven with wetland terraces and floating public walkways. This crucial interdependent relationship between water management and manipulation at both the macro scale of the site and the river, and the micro scale of the domestic landscape became a driver for the project - creating adaptive tidal environments. The design aims to create a systematic, yet dynamic, resilient, and flexible framework rather than a fixed masteplan to accommodate high density housing adapting to the tidal behaviour of the Thames, providing much needed public spaces in the form of tidal pools, wetland parks and floating gardens. The housing is tailored towards the ever more transient lifestyles we lead, providing both permanent and short-term accommodation. Vital to each typology is the interdependency between tidal, social and urban infrastructures, generating dynamic living situations and adaptive prefabricated housing modules. Furthermore, by altering the exterior and interior micro-climates for our daily activities and routines, the future house will subvert and change its environments to curate the thermal performance, as well as our future social behaviour by providing spaces with different types of connections, encouraging both intentional and spontaneous interactions resulting in a gradient of spaces. The proposed onsite tidal power scheme would bring environmental benefits through generating carbon-free electricity. The design proposal explores a hybrid model of Oscillating Hydrofoil tidal power generators, as it promises to be economical as well as environmentally neutral. Putting communities in control of the energy they use can help maintain energy security and tackle climate change; help people save money on their energy bills; and have wider social and economic benefits. The Thames Estuary represents a great opportunity for architectural design, largely due to the pending problems the estuary faces. By responding progressively to these challenges and understanding that conventional buildings and their design could play only a limited role in the area’s future, design solutions can explore new inhabitation possibilities. The project suggests a scenario that asks what if our living environments were adaptive, transient and energy producing, could we imagine a model of a future dynamic city organisation that is not tied to hard infrastructures but would be informed locally through neighbourhood relations.